Have you stopped going to the Coraline site? Scott Daly rules and so does Backfence PDX! SO! 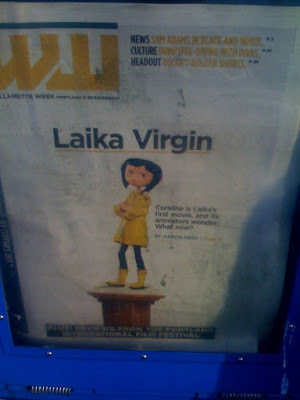 The Coraline weekend (as I like to call it) begins here in Portland! Ok, so I make it sound like it's a big weekend totally devoted to Coraline, and it's not... entirely... except it is for this fan girl! The exciting news is that tomorrow is the premiere here in Portland, and I can at least walk (stand?) by to see the excitement. I've a friend who reviews films that gets to interview Neil Gaiman tomorrow so I'm excited about that, too! Not that I get to go or anything, but I can at least talk to him about it later. AND I shall see it on Saturday (I've decided) so there's that, too. I can't wait! All the stuff they've done in the making of it has just been incredible and inspiring. The way it was crafted, the ads they did, the neat stuff on the website and Mr. B's blog (where you can find a rendition of Sweet Coraline) are really neat ways that really brought not only the fans in, but others that may not have heard of it or know of Neil Gaiman. Well, and theXplodingboys who play Saturday at Lola's. If you're in Portland you should go go go! I'll be there... right after I see Coraline.